THIS BOOK IS OVER 200 PAGES AND INCLUDES DEALER AND PUBLIC INFORMATION, DEALER PRICE BULLETINS AND CODING GUIDES. 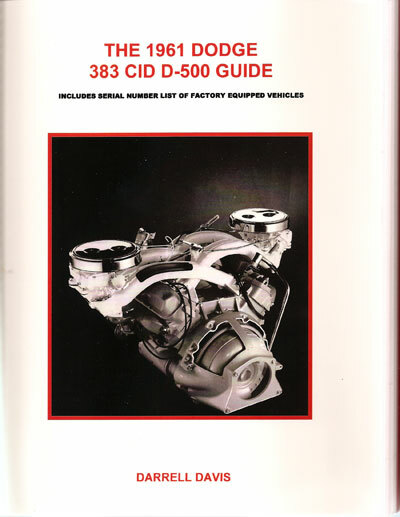 IT ALSO INCLUDES A SERIAL NUMBER LISTING OF EVERY CAR EQUIPPED WITH A 383 CID D-500 PACKAGE. AS EXTRA INFORMATION, DARRELL INCLUDED THE SAME INFORMATION ON THOSE FEW CARS EQUIPPED WITH THE 383 CID 1 X 4V ENGINE OPTION. ALSO INCLUDED IS THE REGION AND DEALER CODE INFORMATION, THE BODY STYLE, COLOR AND TRIM AND THE OPTIONAL EQUIPMENT AND POWER EQUIPMENT INSTALLED. ACCESSORY GROUPS ARE ALSO INCLUDED.